Running is a method of terrestrial locomotion allowing humans and other animals to move rapidly on foot. Running is a type of gait characterized by an aerial phase in which all feet are above the ground (though there are exceptions ). This is in contrast to walking, where one foot is always in contact with the ground, the legs are kept mostly straight and the center of gravity vaults over the stance leg or legs in an inverted pendulum fashion. A characteristic feature of a running body from the viewpoint of spring-mass mechanics is that changes in kinetic and potential energy within a stride occur simultaneously, with energy storage accomplished by springy tendons and passive muscle elasticity. The term running can refer to any of a variety of speeds ranging from jogging to sprinting. Competitive running grew out of religious festivals in various areas such as Greece, Egypt, Asia, and the East African Rift in Africa. The Tailteann Games, an Irish sporting festival in honor of the goddess Tailtiu, dates back to 1829 BCE, and is one of the earliest records of competitive running. The origins of the Olympics and Marathon running are shrouded by myth and legend, though the first recorded games took place in 776 BCE. Running in Ancient Greece can be traced back to these games of 776 BCE. Running gait can be divided into two phases in regard to the lower extremity: stance and swing. These can be further divided into absorption, propulsion, initial swing and terminal swing. Due to the continuous nature of running gait, no certain point is assumed to be the beginning. However, for simplicity, it will be assumed that absorption and footstrike mark the beginning of the running cycle in a body already in motion. Footstrike occurs when a plantar portion of the foot makes initial contact with the ground. Common footstrike types include forefoot, midfoot and heel strike types. These are characterized by initial contact of the ball of the foot, ball and heel of the foot simultaneously and heel of the foot respectively. During this time the hip joint is undergoing extension from being in maximal flexion from the previous swing phase. For proper force absorption, the knee joint should be flexed upon footstrike and the ankle should be slightly in front of the body. Footstrike begins the absorption phase as forces from initial contact are attenuated throughout the lower extremity. Absorption of forces continues as the body moves from footstrike to midstance due to vertical propulsion from the toe-off during a previous gait cycle. Most recent research, particularly regarding the footstrike debate, has focused solely on the absorption phases for injury identification and prevention purposes. The propulsion phase of running involves the movement beginning at midstance until toe off. From a full stride length model however, components of the terminal swing and footstrike can aid in propulsion. Set up for propulsion begins at the end of terminal swing as the hip joint flexes, creating the maximal range of motion for the hip extensors to accelerate through and produce force. As the hip extensors change from reciporatory inhibitors to primary muscle movers, the lower extremity is brought back toward the ground, although aided greatly by the stretch reflex and gravity. Footstrike and absorption phases occur next with two types of outcomes. This phase can be only a continuation of momentum from the stretch reflex reaction to hip flexion, gravity and light hip extension with a heel strike, which does little to provide force absorption through the ankle joint. With a mid/forefoot strike, loading of the gastro-soleus complex from shock absorption will serve to aid in plantar flexion from midstance to toe-off. As the lower extremity enters midstance, true propulsion begins. The hip extensors continue contracting along with help from the acceleration of gravity and the stretch reflex left over from maximal hip flexion during the terminal swing phase. Hip extension pulls the ground underneath the body, thereby pulling the runner forward. During midstance, the knee should be in some degree of knee flexion due to elastic loading from the absorption and footstrike phases to preserve forward momentum. The ankle joint is in dorsiflexion at this point underneath the body, either elastically loaded from a mid/forefoot strike or preparing for stand-alone concentric plantar flexion. All three joints perform the final propulsive movements during toe-off. The plantar flexors plantar flex, pushing off from the ground and returning from dorsiflexion in midstance. This can either occur by releasing the elastic load from an earlier mid/forefoot strike or concentrically contracting from a heel strike. With a forefoot strike, both the ankle and knee joints will release their stored elastic energy from the footstrike/absorption phase. The quadriceps group/knee extensors go into full knee extension, pushing the body off of the ground. At the same time, the knee flexors and stretch reflex pull the knee back into flexion, adding to a pulling motion on the ground and beginning the initial swing phase. The hip extensors extend to maximum, adding the forces pulling and pushing off of the ground. The movement and momentum generated by the hip extensors also contributes to knee flexion and the beginning of the initial swing phase. Initial swing is the response of both stretch reflexes and concentric movements to the propulsion movements of the body. Hip flexion and knee flexion occur beginning the return of the limb to the starting position and setting up for another footstrike. Initial swing ends at midswing, when the limb is again directly underneath the trunk, pelvis and hip with the knee joint flexed and hip flexion continuing. Terminal swing then begins as hip flexion continues to the point of activation of the stretch reflex of the hip extensors. The knee begins to extend slightly as it swings to the anterior portion of the body. The foot then makes contact with the ground with footstrike, completing the running cycle of one side of the lower extremity. Each limb of the lower extremity works opposite to the other. When one side is in toe-off/propulsion, the other hand is in the swing/recovery phase preparing for footstrike. Following toe-off and the beginning of the initial swing of one side, there is a flight phase where neither extremity is in contact with the ground due to the opposite side finishing terminal swing. As the footstrike of the one hand occurs, initial swing continues. The opposing limbs meet with one in midstance and midswing, beginning the propulsion and terminal swing phases. Upper extremity function serves mainly in providing balance in conjunction with the opposing side of the lower extremity. The movement of each leg is paired with the opposite arm which serves to counterbalance the body, particularly during the stance phase. The arms move most effectively (as seen in elite athletes) with the elbow joint at an approximately 90 degrees or less, the hands swinging from the hips up to mid chest level with the opposite leg, the Humerus moving from being parallel with the trunk to approximately 45 degrees shoulder extension (never passing the trunk in flexion) and with as little movement in the transverse plane as possible. The trunk also rotates in conjunction with arm swing. It mainly serves as a balance point from which the limbs are anchored. Thus trunk motion should remain mostly stable with little motion except for slight rotation as excessive movement would contribute to transverse motion and wasted energy. Recent research into various forms of running has focused on the differences, in the potential injury risks and shock absorption capabilities between heel and mid/forefoot footstrikes. It has been shown that heel striking is generally associated with higher rates of injury and impact due to inefficient shock absorption and inefficient biomechanical compensations for these forces. This is due to forces from a heel strike traveling through bones for shock absorption rather than being absorbed by muscles. Since bones cannot disperse forces easily, the forces are transmitted to other parts of the body, including ligaments, joints and bones in the rest of the lower extremity all the way up to the lower back. This causes the body to use abnormal compensatory motions in an attempt to avoid serious bone injuries. These compensations include internal rotation of the tibia, knee and hip joints. Excessive amounts of compensation over time have been linked to higher risk of injuries in those joints as well as the muscles involved in those motions. Conversely, a mid/forefoot strike has been associated with greater efficiency and lower injury risk due to the triceps surae being used as a lever system to absorb forces with the muscles eccentrically rather than through the bone. Landing with a mid/forefoot strike has also been shown to not only properly attenuate shock but allows the triceps surae to aid in propulsion via reflexive plantarflexion after stretching to absorb ground contact forces. Thus a mid/forefoot strike may aid in propulsion. However, even among elite athletes there are variations in self selected footstrike types. This is especially true in longer distance events, where there is a prevalence of heel strikers. There does tend however to be a greater percentage of mid/forefoot striking runners in the elite fields, particularly in the faster racers and the winning individuals or groups. While one could attribute the faster speeds of elite runners compared to recreational runners with similar footstrikes to physiological differences, the hip and joints have been left out of the equation for proper propulsion. This brings up the question as to how heel striking elite distance runners are able to keep up such high paces with a supposedly inefficient and injurious foot strike technique. During running, the speed at which the runner moves may be calculated by multiplying the cadence (steps per second) by the stride length. Running is often measured in terms of pace  in minutes per mile or kilometer. Different types of stride are necessary for different types of running. When sprinting, runners stay on their toes bringing their legs up, using shorter and faster strides. Long distance runners tend to have more relaxed strides that vary. 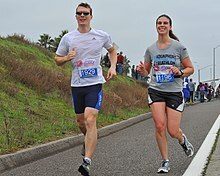 Running can also have psychological benefits, as many participants in the sport report feeling an elated, euphoric state, often referred to as a " runner's high". Running is frequently recommended as therapy for people with clinical depression and people coping with addiction. A possible benefit may be the enjoyment of nature and scenery, which also improves psychological well-being  (see Ecopsychology § Practical benefits). Many injuries are associated with running because of its high-impact nature. Change in running volume may lead to development of patellofemoral pain syndrome, iliotibial band syndrome, patellar tendinopathy, plica syndrome, and medial tibial stress syndrome. Change in running pace may cause Achilles Tendinitis, gastrocnemius injuries, and plantar fasciitis. Repetitive stress on the same tissues without enough time for recovery or running with improper form can lead to many of the above. Runners generally attempt to minimize these injuries by warming up before exercise,  focusing on proper running form, performing strength training exercises, eating a well balanced diet, allowing time for recovery, and "icing" (applying ice to sore muscles or taking an ice bath). Some runners may experience injuries when running on concrete surfaces. The problem with running on concrete is that the body adjusts to this flat surface running, and some of the muscles will become weaker, along with the added impact of running on a harder surface. Therefore, it is advised[ by whom?] to change terrain occasionally – such as trail, beach, or grass running. This is more unstable ground and allows the legs to strengthen different muscles. Runners should be wary of twisting their ankles on such terrain. Running downhill also increases knee stress and should, therefore, be avoided. Reducing the frequency and duration can also prevent injury. ^ Rubenson, Jonas; Heliams, Denham B.; Lloyd, David G.; Fournier, Paul A. (22 May 2004). "Gait selection in the ostrich: mechanical and metabolic characteristics of walking and running with and without an aerial phase". Proceedings of the Royal Society of London B: Biological Sciences. 271 (1543): 1091–1099. doi: 10.1098/rspb.2004.2702. PMC 1691699. PMID 15293864 – via rspb.royalsocietypublishing.org. ^ Cavagna, G. A.; Saibene, F. P.; Margaria, R. (1964). "Mechanical Work in Running". Journal of Applied Physiology. 19 (2): 249–256. doi: 10.1152/jappl.1964.19.2.249. PMID 14155290. ^ Louis Liebenberg (December 2006). "Persistence Hunting by Modern Hunter‐Gatherers". Current Anthropology. Current Anthropology & The University of Chicago Press. 47 (6): 1017–1026. doi: 10.1086/508695. JSTOR 10.1086/508695. ^ a b Anderson, T (1996). "Biomechanics and Running Economy". Sports Medicine. 22 (2): 76–89. doi: 10.2165/00007256-199622020-00003. PMID 8857704. ^ a b c d Nicola, T. L.; Jewison, D. J. (2012). "The Anatomy and Biomechanics of Running". Clinical Journal of Sport Medicine. 31 (2): 187–201. doi: 10.1016/j.csm.2011.10.001. PMID 22341011. ^ a b c Novacheck, T.F. (1998). "The biomechanics of running". Gait & Posture. 7 (1): 77–95. doi: 10.1016/s0966-6362(97)00038-6. ^ a b c d Schache, A.G. (1999). "The coordinated movement of the lumbo-pelvic-hip complex during running: a literature review". Gait & Posture. 10 (1): 30–47. doi: 10.1016/s0966-6362(99)00025-9. ^ a b c Daoud, A.I. (2012). "Foot Strike and Injury Rates in Endurance Runners: a retrospective study". Medicine & Science in Sports & Exercise. 44 (7): 1325–1334. doi: 10.1249/mss.0b013e3182465115. PMID 22217561. ^ Larson, P (2011). "Foot strike patterns of recreational and sub-elite runners in a long-distance road race". Journal of Sports Sciences. 29 (15): 1665–1673. doi: 10.1080/02640414.2011.610347. PMID 22092253. ^ Smeathers, J.E. (1989). "Transient Vibrations Caused by Heel Strike". Journal of Engineering in Medicine. 203 (4): 181–186. doi: 10.1243/PIME_PROC_1989_203_036_01. PMID 2701953. ^ a b c d e f g Hammer, S.R. (2010). "Muscle contributions to propulsion and support during running". Journal of Biomechanics. 43 (14): 2709–2716. doi: 10.1016/j.jbiomech.2010.06.025. PMC 2973845. PMID 20691972. ^ a b Ardigo, L.P. (2008). "Metabolic and mechanical aspects of foot landing type, forefoot and rearfoot strike, in human running". Acta Physiologica Scandinavica. 155 (1): 17–22. doi: 10.1111/j.1748-1716.1995.tb09943.x. PMID 8553873. ^ a b c Bergmann, G. (2000). "Influence of shoes and heel strike on the loading of the hip joint". Journal of Biomechanics. 28 (7): 817–827. doi: 10.1016/0021-9290(94)00129-r.
^ a b c Lieberman, D. (2010). "Foot strike patterns and collision forces in habitually barefoot versus shod runners". Nature. 463 (7280): 531–535. doi: 10.1038/nature08723. PMID 20111000. ^ a b Williams, D.S. (2000). "Lower Extremity Mechanics in Runners with a Converted Forefoot Strike Pattern". Journal of Applied Biomechanics. 16 (2): 210–218. doi: 10.1123/jab.16.2.210. ^ a b Kubo, K. (2000). "Elastic properties of muscle-tendon complex in long-distance runners". European Journal of Applied Physiology. 81 (3): 181–187. doi: 10.1007/s004210050028. PMID 10638375. ^ a b Thys, H. (1975). "The role played by elasticity in an exercise involving movements of small amplitude". European Journal of Physiology. 354 (3): 281–286. doi: 10.1007/bf00584651. ^ Verdini, F. (2005). "Identification and characterization of heel strike transient". Gait & Posture. 24 (1): 77–84. doi: 10.1016/j.gaitpost.2005.07.008. PMID 16263287. ^ Walter, N.E. (1977). "Stress fractures in young athletes". The American Journal of Sports Medicine. 5 (4): 165–170. doi: 10.1177/036354657700500405. PMID 883588. ^ Perl, D.P (2012). "Effects of Footwear and Strike Type of Running Economy". Medicine & Science in Sports & Exercise. 44 (7): 1335–1343. doi: 10.1249/mss.0b013e318247989e. PMID 22217565. ^ Hasegawa, H. (2007). "Foot Strike Patterns of Runners at the 15-km Point During Elite-Level Half Marathon". Journal of Strength and Conditioning Research. 21 (3): 888–893. doi: 10.1519/00124278-200708000-00040. ^ Larson, P. (2011). "Foot strike patterns of recreational and sub-elite runners in a long-distance road race". Journal of Sports Sciences. 29 (15): 1665–1673. doi: 10.1080/02640414.2011.610347. PMID 22092253. ^ a b Pink, M. (1994). "Lower Extremity Range of Motion in the Recreational Sport Runner". American Journal of Sports Medicine. 22 (4): 541–549. doi: 10.1177/036354659402200418. PMID 7943522. ^ a b Weyand, P.G. (2010). "Faster top running speeds are achieved with greater ground forces not more rapid leg movements". Journal of Applied Physiology. 89 (5): 1991–1999. doi: 10.1152/jappl.2000.89.5.1991. PMID 11053354. ^ Mercer, J.A. (2003). "Individual Effects of Stride Length and Frequency on Shock Attenuation during Running". Medicine & Science in Sports & Science. 35 (2): 307–313. doi: 10.1249/01.mss.0000048837.81430.e7. PMID 12569221. ^ Mercer, J.A. (2002). "Relationship between shock attenuation and stride length during running at different velocities". European Journal of Applied Physiology. 87 (4–5): 403–408. doi: 10.1007/s00421-002-0646-9. PMID 12172880. ^ a b Leskinen, A. (2009). 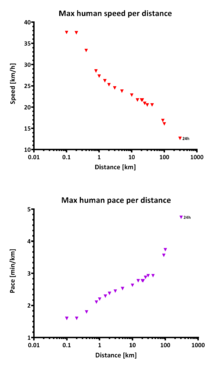 "Comparison of running kinematics between elite and national-standard 1500-m runners". Sports Biomechanics. 8 (1): 1–9. doi: 10.1080/14763140802632382. PMID 19391490. ^ Lafortune, M.A. (2006). "Dominant role of interface over knee angle for cushioning impact loading and regulating initial leg stiffness". Journal of Biomechanics. 29 (12): 1523–1529. doi: 10.1016/s0021-9290(96)80003-0. ^ Lavie CJ, Lee DC, Sui X, Arena R, O'Keefe JH, Church TS, Milani RV, Blair SN. Effects of Running on Chronic Diseases and Cardiovascular and All-Cause Mortality. Mayo Clin Proc. 2015 Nov;90(11): 1541–1552. doi: 10.1016/j.mayocp.2015.08.001. Epub 2015 Sep 8. Review. PubMed PMID 26362561. ^ Boecker, H.; Sprenger, T.; Spilker, M. E.; Henriksen, G.; Koppenhoefer, M.; Wagner, K. J.; Valet, M.; Berthele, A.; Tolle, T. R. (2008). "The Runner's High: Opioidergic Mechanisms in the Human Brain" (PDF). Cerebral Cortex. 18 (11): 2523–2531. doi: 10.1093/cercor/bhn013. PMID 18296435. ^ Barton, J.; Pretty, J. (2010). "What is the Best Dose of Nature and Green Exercise for Improving Mental Health? A Multi-Study Analysis". Environmental Science & Technology. 44 (10): 3947–3955. doi: 10.1021/es903183r. PMID 20337470. ^ van Praag H, Kempermann G, Gage FH (March 1999). "Running increases cell proliferation and neurogenesis in the adult mouse dentate gyrus". Nat. Neurosci. 2 (3): 266–270. doi: 10.1038/6368. PMID 10195220.